Have you ever been frustrated using Microsoft Word because you couldn't remember what you should click to get something to look just right? Me, too. 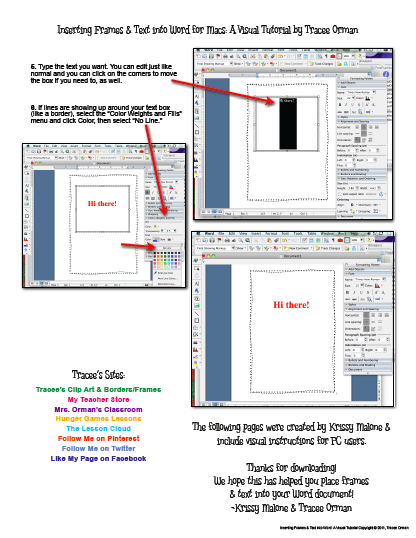 I also had many teachers ask me how to insert my frames, borders, and other clip art png files into a Word document. So, I created a visual tutorial. The problem I had, however, is that I only use a Mac. That didn't help those teachers who use a PC and Microsoft for Windows. So Krissy Malone, a fellow TpT teacher, came to my rescue! She created the PC instructions, complete with screenshots. So whether you use a Mac or a PC, we hope you will find these useful! I don't see a formatting palette anywhere. Are you using an older MacBook or am I? I purchased the frames but can't seem to insert them. Or I can insert them but then can't type any words over them. 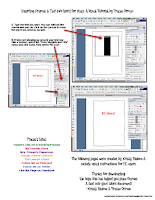 Your pages you show on here are not what I see on my word document.